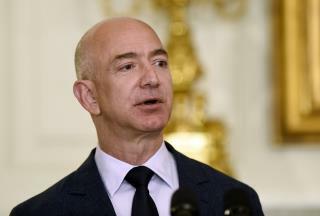 (Newser) – Jeff Bezos, of course, gained entry to the billionaires' club years ago. This week, however, Bloomberg reports that the founder and CEO of Amazon reached a far higher echelon: the club of those worth $100 billion. In fact, at the moment, the 53-year-old Bezos is in that club all by himself. According to the Bloomberg Billionaires Index, Bezos' net worth surged past the milestone as shares of Amazon rose on Black Friday enthusiasm. I admire him for his business acumen and ability to grow his fortune, but he is a BIG threat to out Republic with his left leaning tendencies. He is an American George Soros. Thanks for the Funko Pops Jeff, they arrived in good condition. Hey, how about he spends it on his employees. And no, I'm not talking about the government confiscating it, bypassing the working guy and taking it for themselves just so they can have a job and feel like do gooders in a suit.